Today is February 29. Leap Year! Leprechauns and pots of gold! And it’s the last day of heart month. For some folks, it’s also the season of Lent. Both seasons exist for one reason – love. I don’t know if you indulged your heart during February and if you are denying it now during Lent. I don’t know if either position increases love for you or if you find yourself trying to hide increased amounts of guilt, shame, and pounds. Not sure. I don’t do either one particularly well. Too much and too little are two gears that always get stuck with me. So, if there is something that you know hurts you and those you love…stop it. Get help if help encourages you. Give yourself a much deserved break. Pray. Be still. Go outside and play. But, while you are doing these new things and feeling just a little better….pause…….to be quiet enough to hear the messages driving the behavior that you believe is so bad. You will hear your heart hurting. You will hear ugly taunts. If February is about indulging and Lent is about denial and both are about love….then, the real love you most deserve and need may be your own. Lent is a lovely time to practice forgiveness-beginning with ourselves. It’s so easy and so much our default mode to think our life’s condition and even our physical habits are because someone else hurt us or betrayed us or abandoned us. And we so easily believe the lies that others say about us. Then, we take it a step further and condemn ourselves for not being more brilliant in the face of betrayals and loss. Just the thought drives me to the chocoate chip cookies. This season of winter into spring offers each of us a new beginning; a fresh start; a resurrection. Hope. And when you pause…really pause….to identify the messages behind the behavior…you can choose to keep believing them or not. And if they are lies…guess what? You can kick them to the curb and leave them there. And the pounds and headaches and back aches and who knows what else – begin to diminish. See, all that resentment, anger, bitterness we swallow just ends up making us sick, fat, and drunk. And the heart that is wrapped in deadly barbed wire – is our own. Get yourself some wire cutters. Free your beautiful heart. It’s Leap Year into Lent. 2. Harder than you expected…. Two weeks into this coaching paradigm and I agree with her. These two weeks have begun with a kind of wilderness experience….a forced aloneness; quiet; slow illumination of dark spaces. I want more than to simply make better decisions. I want more than to simply respond better in difficult circumstances. I want more than to simply replace bad habits with good ones. I want to live one very good, true life….not a perfect one; but not an inauthentic one; not a false one. A free one. A true one. And I need light to do so. I need to see what the light illuminates and deal with the stuff hidden in corners and closets. I want to forgive and be forgiven. I want to trust and be trusted. I want to offer grace and truth without compromising either. This living true thing is hard work. As long as I was the only one aware of the mess in my own corners and closet and I held the only key to those spaces, I could manuever around pretty well. Manuevering and managing just isn’t good enough anymore. I believe the light bulbs have always been there. They just needed the switches to be flipped. 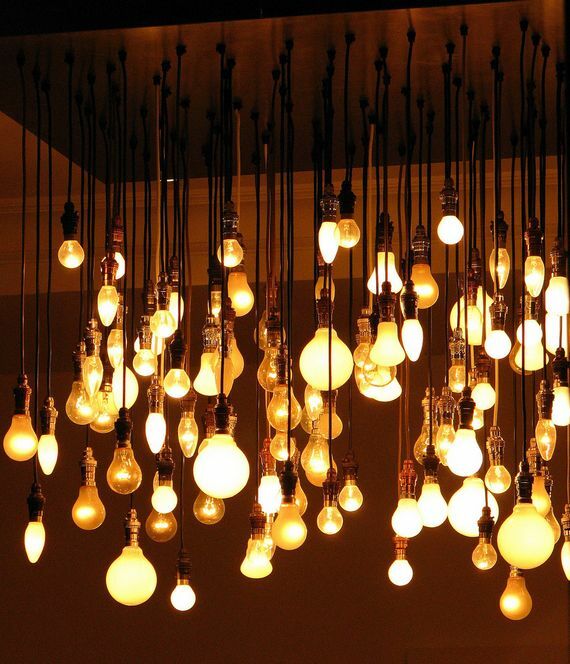 Takes some getting used to, though….all this light. I am a southern girl who craves snow. I crave the bold, beautiful invitation to escape from the ordinary to the extraordinary. I have never lost my childlike love of snowflakes falling from dark skies. 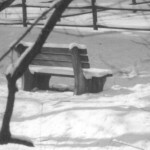 So, I am missing snow alot this winter and the sacred stillness it offers. 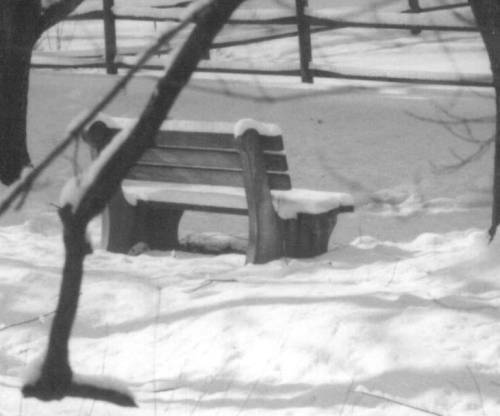 Imagine each of us waking this morning with our park benches beckoning us to a bleak but beautiful black and white stillness. Imagine accepting such an invitation. So, that’s just what I think I will do. Accept February’s invitation to stillness – with or without real snow. I’ve allowed so much noise in my life that I’ve sorely missed the stillness. I talk way too much. I am a wordy person. Seriously? Have I any idea how to hear my heart? So, I thought I would turn the tables on myself. I have signed up to be coached. By me – cause I have nothing left to prove to myself. And I know when I’m lying. Every step I ask my clients to take, I will take. So….yesterday I spent a good part of the day answering the introductory questionaire I give to my clients. I’ve previously completed it but it was a slightly doctored version for my first lifecoach caused I really wanted him to like me. So, I had to glitter up some otherwise embarrassing chapters. It took alot of time for me to sit still on that park bench so I could hear what I had avoided for so long. I started with the easy, obvious stuff. The annoying habits. The dysfunctional thinking. The pound bag of m&m’s. The sloppy office space. The procrastination. The grudges. You know…stuff like that. I’ve spent a life time working hard on those behaviors and habits ’cause I believed that’s what mattered. But, after all that concentration and resolutions and counseling and hard work, that stuff hasn’t changed all that much. What remains are questions….lots of them…. What am I thinking when I justify doing or saying something I don’t even agree with or know I will regret or will cause me or someone else suffering? Truth be told, I want a silver bullet – a quick fix – to feel better and to tidy up my mess. And, until I find that silver bullet, I choose to manage the mess. I choose….. So, today I am being still on my park bench. There are habits I want to change or stop altogether. There are no excuses not to do so right now. I have hired a coach to run the miles with me. I know I will want to quit. Give myself an out. I am prone to conclude that it is too late…..that I am too old. My coach will remind me to read what I have written in stark black and white. Like snow. If you’re interested, I promise to be honest about this journey. Is it harder than I thought? Would I recommend it to you? Look up at the winter sky….feels like snow.